Thanks to everyone who weighed in on what they thought was the answer to Friday’s mystery photo. Most people recognized pretty quickly that it was stone of some kind and guessed they were looking at tile or a countertop maybe. Close, but not quite. Dave got it right: this is in fact marble for Matt’s bathroom shower. More specifically, it’s the slab that will go on the top of the bench in the shower. 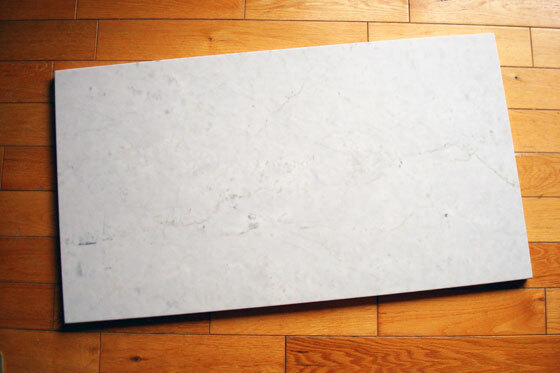 It’s a beautiful piece of white and grey marble. This was my first time buying marble, and finding the perfect piece was not as easy as I expected. We needed one solid surface for the top of the bench. No seams or joints minimizes our risk of leaks. However, none of the tile or home improvement stores that we visited dealt in large (but smaller than counter-size) pieces of marble. The top of the bench had to be 18″ x 32 1/4″, and the best I found was 18″ square tile. That would have meant a seam, so that was a no-go. As well, I was picky about the colour and veining on the marble. I wanted something mostly white with smooth grey veining (not too speckled). Granite suppliers are common in our area, but in my experience they tended to have a very limited selection of marble. Plus, understandably none of them wanted to cut into a countertop-size slab and end up with a leftover that was too small to use on another project. Finally, we found a granite supplier that had a larger selection of marble and a good collection of remnants. They let us go through their warehouse and pulled out many pieces for me to examine. In the end, we found a piece that was just the right size and just the right colour. They gave us a good deal on the price and cut and polished it to my exact specifications. Here’s a sneak peak of how it looks with the marble mosaic we’re going to be using for the shower floor. The slab is a great match to the hexagon tiles. I love marble over any other stone, and I’m really happy that we’re going to be able to use some in Matt’s new bathroom. Our tile order should be arriving shortly, so stay tuned for more updates. Any other marble fans out there? Anyone have tips for sourcing natural stone? And looking ahead to the next stage, any advice for installation? Looks like a Sarah Richardson colour scheme… looks great! Thanks for the compliment, Sandy! I do love me some SR design. That’s beautiful! I love the big piece against the little hexagons. 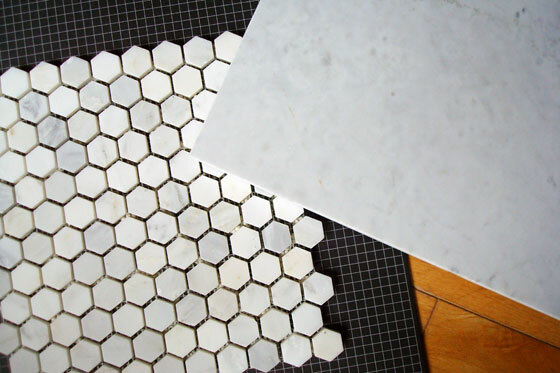 Are you going to tile it yourself? You bet. You’ll get to that saga shortly.